This is useful to find the business emails and phone numbers of the added prospects. It has a dashboard with various options which is well organized and is useful in finding the information which is not available on the web. This helps recruiters, sales, and marketing executives. People.AI is great for logging all activities (Calls, Email, Meetings) to their related records in Salesforce. Aside from that, People.AI offers a great UI to help analyze and provide insights into activity. People.ai provides a critical layer of intelligence for our team. We have a full picture of all activity going on in our accounts, understand where our team is spending their time, and what has the biggest impact. 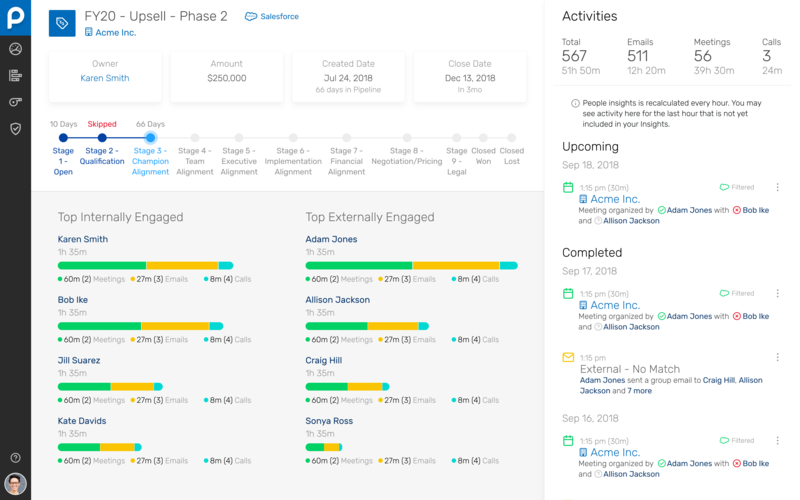 We have automated Salesforce Sync in 30 Days and using People.ai helped us get a clear picture of sales activity by using CRM Sync and gave salespeople 20% of their time back. Contact cloud is still growing so there can be non-synced contacts. There is a sync delay for activities which can be confusing to sales reps.
Clari primarily focused on attaching activities to Opportunities; Yesware primarily focused on email templates and was limited in its ability to track calls. We selected People.AI because it offered more than both platforms and its strengths were apparent in their UI design and AI delivery of insights. People.ai has helped our business meet and prove through data that we are improving our Sales Rep's time spent on selling activities, a key metric for our transformation. People.ai reduced the amount of manual entry required by the reps, giving back time, and the data capture was able to show that since turning on People.ai, the reps have jumped in their external engagement by 10%.